The Wind Clan prefer to soar the sky, weaving in and out around the clouds around them. The Wind Clan abhor fighting, and seek a peaceful treaty instead of full scale war. During the Sealing, the Wind Dragons used their powers to hurl massive chunks at earth at the hordes of undead commanded by the Old Ones. They also used their powers of air to warp illusions around the Old Ones, to distract them from the Sealing Ritual. With their powers after the Sealing, they also raised the sky island that now houses the High Citadel of the Elves. 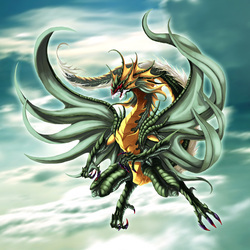 Wind Clan Dragons have the unique ability to fly without first having to flap their wings, a trait given to them thanks to their master of Wind itself. This bonus means that during battle, they do not have to spend 1 turn to start flying, and can move immediately after beginning to fly.